Why I didn't "crop" this image. First off..... there will be some that say... all the sand in the foreground isn't "necessary" , and had this been "their" picture, they would have cropped it down some.... which believe it or not gives you a whole different image. If you look a little more closely ..... you'll notice how there's almost an equal amount of the sky, ocean and sand in the image. Sort of like 3 different bands of colors running horizontal in the image. 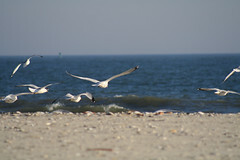 And then the lovely seagulls were captured right in the middle "band" of color..in this case the ocean.